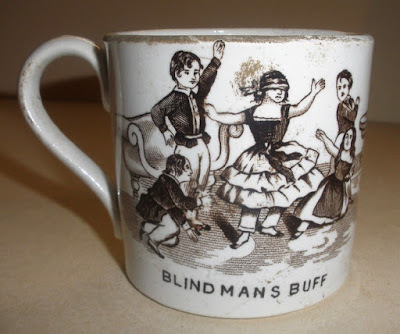 Mid 19th century 2.5 inch child's mug "Blind Man's Buff"
Lots of common children's games appear on transferware plates and mugs: for example, blind man's buff (or bluff) and marbles. 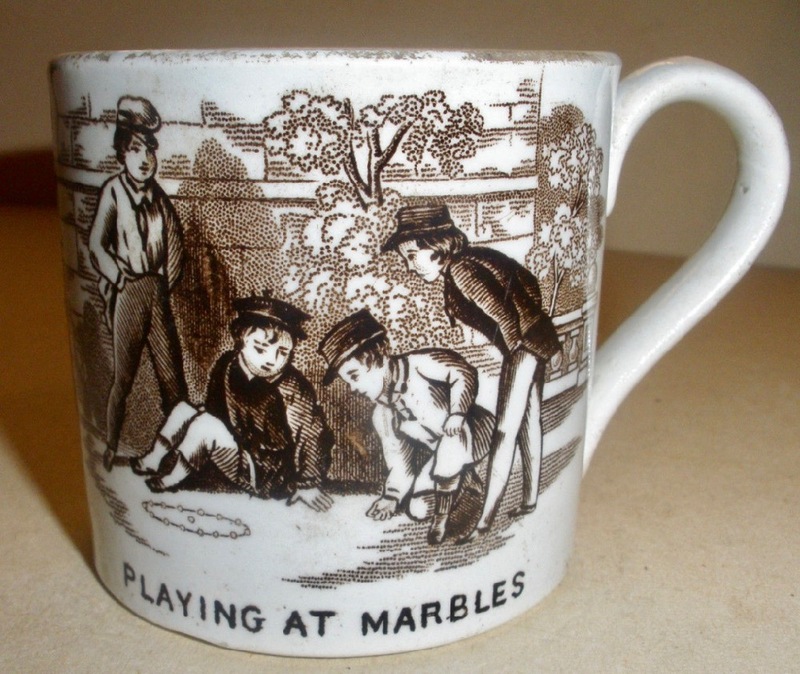 Mid 19th century 2.5 inch child's mug "Playing At Marbles"
These games were still common when I was a child in the 1950s, but I wondered if the games are still played today. 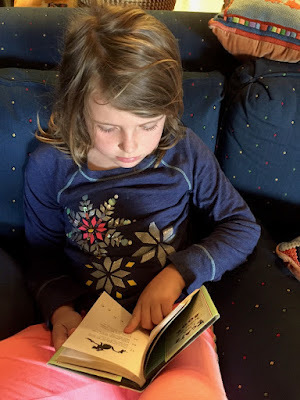 I showed my seven year old granddaughter some of the patterns. She knew about blind man's buff, marbles, charades, leap frog, rope jumping, and kite flying. 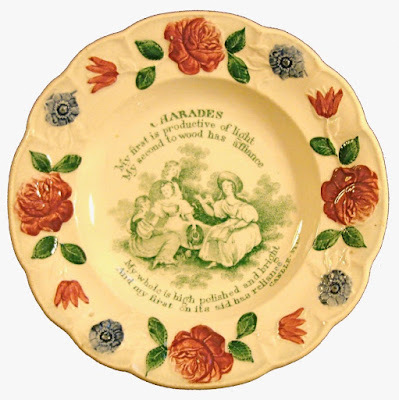 Child's 6 inch plate with the following text: "Charades/My first is productive of the light/My second to wood has affiance/My whole is high polished and bright/And my first on its aid has reliance/Candle-Stick." Maya didn't feel this was a good example of Charades. Child's 2.44 inch mug "Leap Frog"
She also knew some top games, although not Whip-Top. She and I were totally puzzled by Puss in the Corner, so I thought we'd do a bit of research. Wikipedia is my go-to encyclopedia, although I still have my late 1970s set of World Books. Here's a link to Puss in the Corner. Maya thought she'd teach the game to her school friends. 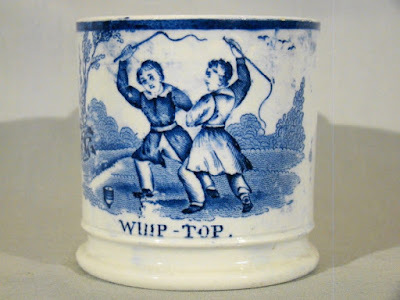 She was also unfamiliar with "Thump Away Jack," but she felt "Thump Away Jack" wouldn't and shouldn't be allowed anymore. I agreed. 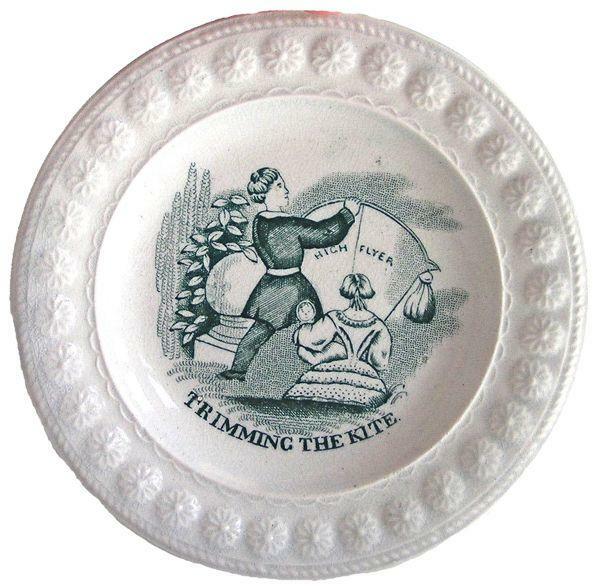 Child's 6.25 inch plate"Thump Away, Jack" The entire verse, which is difficult to see, reads: ""Thump away Jack -- take care of his head/ It's all in good fun -- now hit him hard Ned." We were both surprised that there were no plates that feature Hop Scotch. It was such a popular game when I was a child and continues popular today. However, Maya and I were very happy to see a plate that showed children reading books to one another. She was shocked last year when I told her there were no iPads when I was a little girl. Her pity was touching. However, now that reading is a passion for her, she no longer feels sorry for me. Although, she does love her apps. Since it's the middle of May, it's past the time to write this post about April transferware patterns. I suppose I'd better get started on May too! As I have said before, patterns with months make nice birthday presents. My children have more than one. 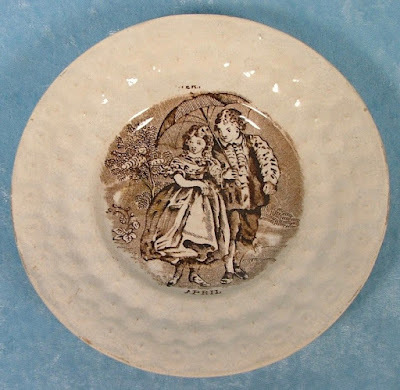 I'll start with a Wedgwood plate printed with the April tile pattern. 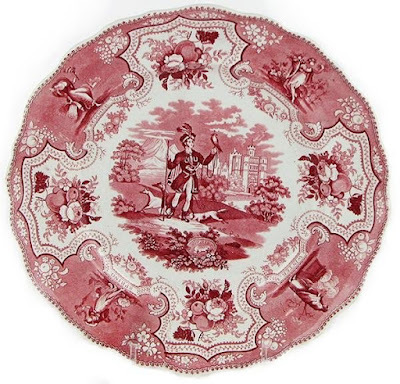 Remember that the month patterns were originally made for tiles, but proved so popular that Wedgwood adapted them for plates. Wedgwood paired the tiles with borders already in use. Here, the "Ivanhoe" border was used. 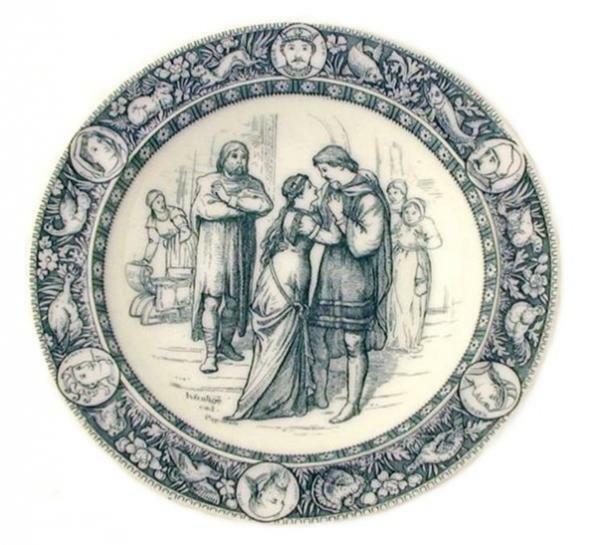 Not surprisingly, the border is mainly found with centers that depict the Sir Walter Scott story of "Ivanhoe." 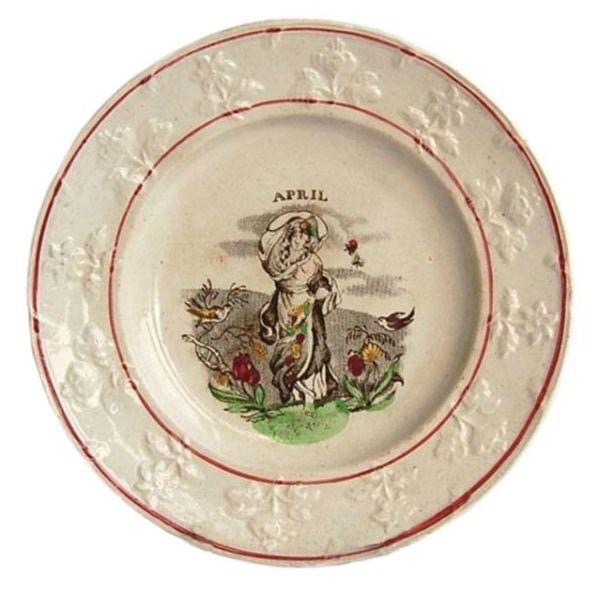 Wedgwood (1759-2005) Month plate "April," ca. 1880. The April center is paired with Wedgwood's Ivanhoe border. 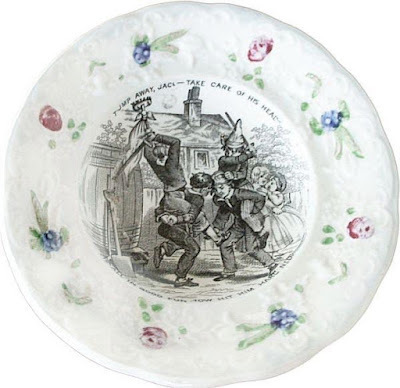 I added a photo of an "Ivanhoe" plate to make my text clearer. 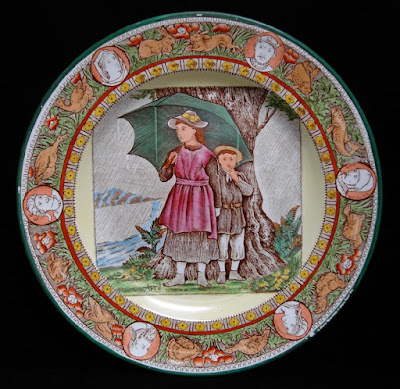 Wedgwood (1759-2005) soup plate from the "Ivanhoe" series designed by Thomas Allen, ca. 1882. 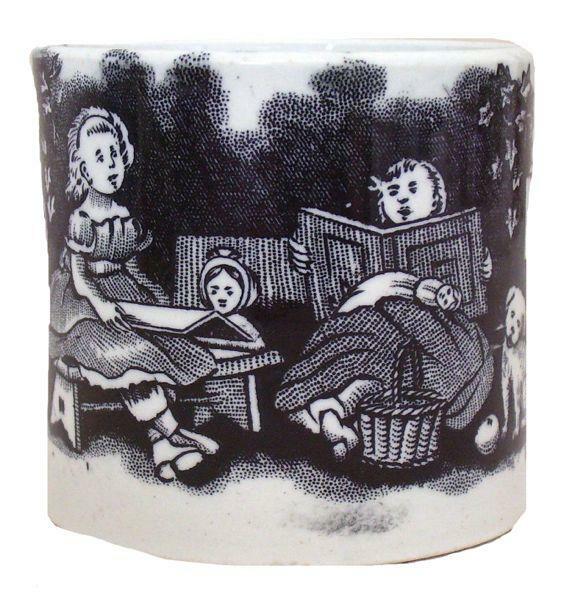 The border was popular, so Wedgwood used it with their month tiles too. Below is an April pattern that is part of a series known as "Seasons." The word "April" is found in the circular cartouche in the bottom of the center of the pattern. Here, the month of April is illustrated by a man who is hawking, not the usual rainy scene with an umbrella. 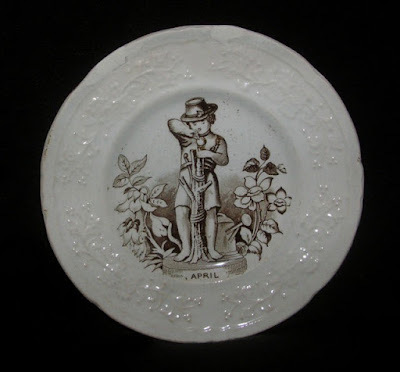 William Adams IV & Sons (1829-1861) 10.62 inch plate printed in the "April" pattern from the Seasons series. 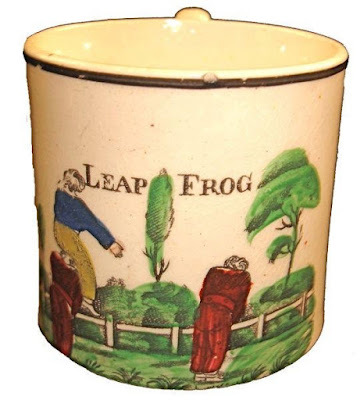 Many of the April patterns were made for children. 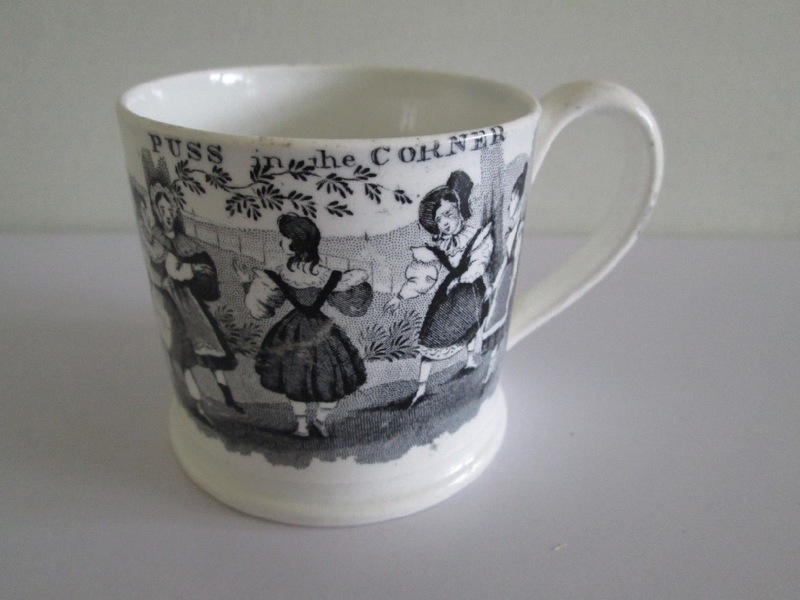 They were popular gifts in the 19th century and continue popular today. 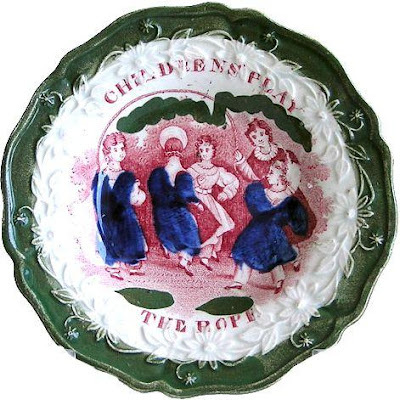 Child's plate printed with a figure representing "April." It looks as if he is doing the Spring pruning. 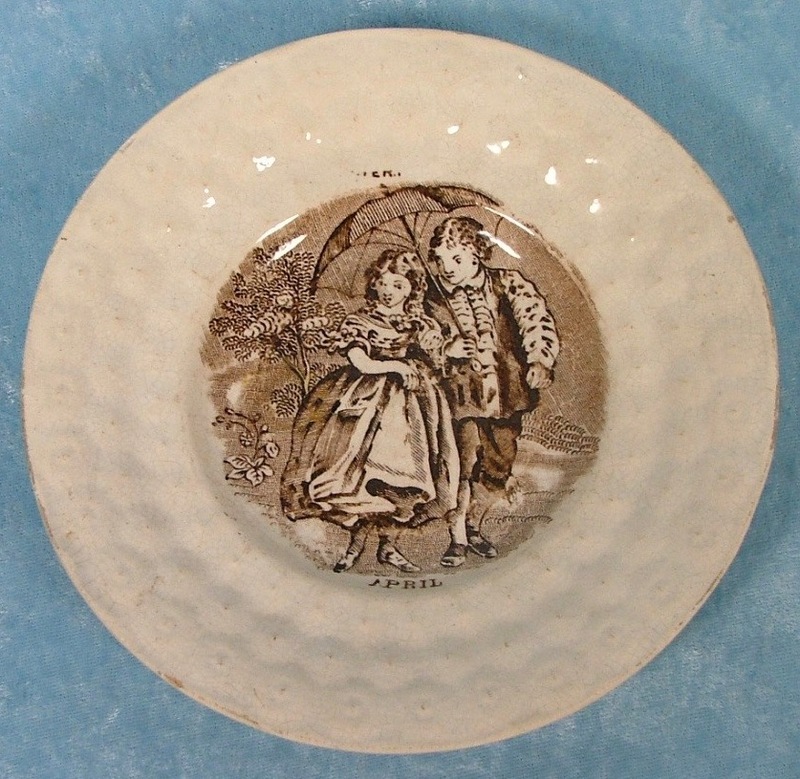 Child's 7.25 inch "April" plate by an unknown maker. Notice that is is nearly the same as the pattern below. 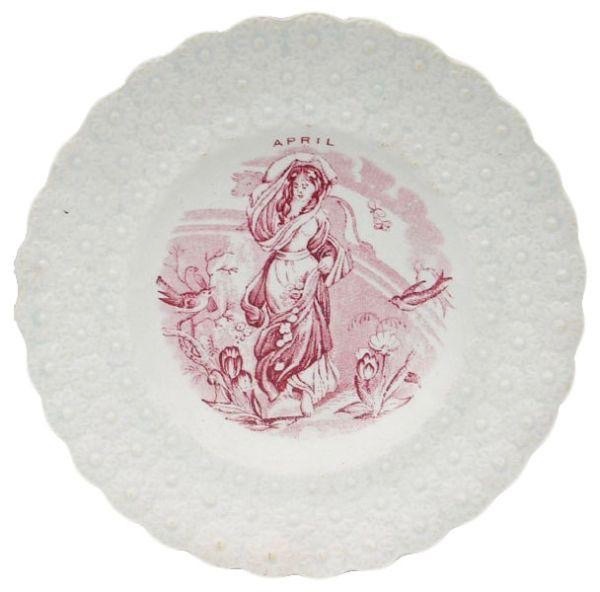 Scott (1800-1897) "April" 6.5 inch plate. 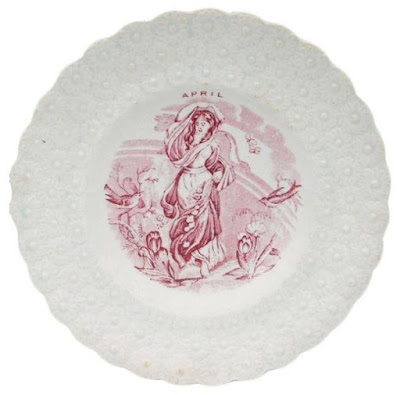 Although the pattern looks the same as the pattern on the plate above, this one has the sign of the zodiac for April behind the girl. The head of Taurus, the bull, is next to the girl's left arm, and its lower body and tail are near her right arm. "April" child's plate showing two children with the ubiquitous April umbrella. Let me know if you have any April transferware patterns.